Context: Today exclusive breastfeeding through the first 6 months of the infant's life has become a challenging issue in the health-care system. It seems the health literacy to be an important element in the women's ability to understanding, processing, and practice on health information. Aims: The aim of this study was determining the relationship between maternal health literacy and their breastfeeding pattern. Setting and Design: This cross-sectional study was conducted in comprehensive health-care centers in Rafsanjan, Iran. Materials and Methods: In this study, 461 mothers who had 6-month infants and referred to comprehensive health-care centers, from November 2015 to May 2016, were selected by quota and systematic sampling method. The data collection tools were the demographic and standard health literacy for Iranian adults and the breastfeeding pattern questionnaires. Statistical Analysis Used: Data were analyzed using descriptive statistics (mean, standard deviation, and frequency), Chi-square, ANOVA test at a significant level of 0.05. Results: The rate of starting breastfeeding in the 1st h after birth was 70.1% and the exclusive breastfeeding rate until 6 months were 68.8%. Health literacy of 5.2% of mothers was inadequate, 71.8% were adequate and excellent. There was no significant statistical relationship between breastfeeding in the early postpartum period and breastfeeding pattern with mothers' health literacy level. Conclusion: Breastfeeding pattern of mothers is independent of their health literacy and it seems to take place under the influence of other personal and social-cultural factors. The significance of optimal nourishment of infants has been taken for granted as a major health issue over the past few decades. Based on the reports made by the World Health Organization, as the first natural food, breastfeeding provides almost all the nutrients needed in the first 6 months of life, more than half of these needs in the second 6 months and one-third during the 2nd year of childhood. While improving the cognitive and sensory development of children and protecting them against infections and chronic diseases, breastfeeding as a safe nutritional method reduces the mortality rate due to childhood illness, which will be along with the health and well-being of mothers including reduction of ovarian and breast cancer, increased birth distances and increased national and family resources., In addition to the positive health effects during infancy, breastfeeding also reduces the risk of obesity and hypertension, hypercholesterolemia and the risk of developing type 2 diabetes in the long term. It also enhances the intelligence performance. Breastfeeding is considered a natural behavior, although it may be associated with problems and challenges for some mothers with infants up to 6 months of age. In a systematic review, the researchers estimated that exclusive breastfeeding in the Middle Eastern countries was 34.3%, this rate was 49.1% in Iran, 43.1% in Malaysia, 40% in Indonesia, and 16.8% in the United States. Some risk factors affect the mothers' ability to start and continue breastfeeding. Preterm labor and cesarean are among known causes. Depression, traumatic delivery, low education of mothers, return to work, lack of adequate guidance for breastfeeding, lack of assistance of the spouse for taking care of the baby, and the negative reactions of the mother to the postpartum events are also other reported factors. Researchers classified maternal factors affecting exclusive breastfeeding up to 6 months in three main categories: social-demographic, biological-physical, and psychological-social. Moreover, the environmental factors and health promotion interventions were also considered effective in this issue. Since health literacy provides the skills for reading, accessing, understanding, and evaluating health information and ultimately its use for decision-making on health issues for individuals, it seems to be among the determinants of mothers' breastfeeding behaviors. The role and effect of health literacy on the display of healthy behaviors are not well defined in the current literature reviews. However, several evidence implies on the favorable health outcomes in the presence of health literacy., However, based on some studies, some healthy women behaviors, namely, conducting mammography and cancer screening tests take place independent of health literacy. By and large, a limited number of studies evaluated the relationship between mothers' health literacy and their breastfeeding behaviors. However, the existing evidence suggests a positive relationship between mother's health literacy with the onset or continuation of breastfeeding,, and the perceived self-efficacy of pregnant mothers for breastfeeding, Considering that breastfeeding is a complex social-cultural issue, and because of limited study in this regard on Iranian women have been carried out, this study was designed aiming at determining the relationship between mother's health literacy and their breastfeeding pattern. The present cross-sectional study investigated the relationship between health literacy and the breastfeeding pattern of mothers covered by comprehensive health services centers in Rafsanjan in Kerman province, Iran. The study was conducted within 6 months from November 2015 to May 2016. After the approval of the project at the research council of Rafsanjan University of Medical Sciences and receiving the code of ethics 1394.83 IR. RUMS. REC., the researchers referred to eight comprehensive health-care centers and began sampling. The sample comprised mothers who presented to health centers for monitoring the growth and development of their 6-month infants. The inclusion criteria for infants included as follows: having 6 months age, lack of congenital malformations, being born single, and not being adopted, and for mothers included as follows: lack of known psychiatric illness and lack of medical constraints for breastfeeding. Exclusion criteria included unwillingness to cooperate in completing the questionnaire, inability to answer questions or incomplete answer to the questionnaire. The sample size was estimated 466 patients Multi-stage sampling was used for sampling. First, with quota sampling method based on the births list of the past 6 months, the share of each center was determined from the total size of the sample and then, systematic random sampling method was used, proportionate to each center's share from the above list, the presenters to the centers were randomly selected. The research partners (the selected staff at health centers) while explaining the research purposes and the confidentiality of the information included those mothers who were willing to participate in the study. The informed consent was taken orally. It should be noted that all mothers ensured that the presence or absence of them in the study did not influence their infant's routine health care. The data collection instrument included a demographic questionnaire for mothers and infants, and characteristics related to pregnancy and delivery, and the time of the onset and the duration of breastfeeding and the breastfeeding pattern of mothers (exclusive breastfed, predominantly breastfed, predominantly fed by baby formula, exclusively fed by baby formula) and also the standard health literacy questionnaire of Iranian urban population (aged 18–65). The tool was published by Montazeri et al., in 2014 with 33 items in 5 parts including: reading areas (4 items), access (6 items), comprehension (7 items), evaluation (4 items), and decision-making and acting (with 12 items). In the 5-point Likert scale, scoring was as always (5) usually (4) sometimes (3) and seldom (2) and never (1). The raw score of each person is obtained in the subscales from the algebra sum of the points; then, according to the instrument instruction, these scores were converted to the range 0–100 according to the following formula. To calculate the total score, the score of the subscales (based on the 0–100 range) were summed up and the result was divided by 5 (number subscales). To rank the health literacy level, the score of 0–50, 50.1–66, 66.1–84 and 84.1–100 are considered to indicate inadequate, not very adequate, adequate, and excellent levels, respectively. To ensure to the validity of questionnaire the exploratory factor analysis performed, The 33 items were loaded indicating a 5-factor solution that jointly explained 53.2% of the variance observed. The internal consistency showed satisfactory results with Cronbach's alpha coefficients ranging from 0.72–0.89. Questionnaires were filled by women as self-report, but if the samples lacked sufficient time to complete the questionnaire, the questionnaire was filled as in-person interviews to spend less time. Data analysis was performed using SPSS software version 21 (IBM, Chicago) using descriptive statistics (mean, standard deviation [SD] frequency), Kolmogorov–Smirnov test (determining normality of data), Chi-square (comparing frequencies), and ANOVA (comparing means between groups) tests at the significance level 0.05. In the data analysis step, five questionnaires were excluded due to incomplete response and a sum of 461 questionnaires was analyzed. The mean and SD of the age of the mothers were 29.07 ± 5.23 with a minimum and a maximum age of 15 and 46, respectively. Approximately 83% of women were housewives, and nearly half of them held a Diploma degree, 12.1% had under Diploma education, and the rest had university degrees. Body mass index (BMI) of 29.3% of mothers was normal, 37.5% overweight, and the rest were obese or thin equally. Regarding the pregnancy and childbirth characteristics, 45.6% had their first delivery. The mean and SD of the number of deliveries was 1.77 ± 0.83 with at least 1 delivery and at most 5. Approximately 35.4% had vaginal delivery and the rest had a cesarean. About 49% of the babies were female and the rest were male [Table 1]. The rate for starting breastfeeding was reported 70.1% by mothers during the 1st h after birth. Investigations on breastfeeding pattern indicated that 68.8% of infants were exclusively breastfed for 6 months; this is 6.3% for 1 month, 6.1 for 1–3 months, and 18.8% for 4–5 months. Approximately 24.5% of mothers predominantly breastfed their infants, 3.3% predominantly fed with baby formula and the rest exclusively fed with baby formula. Mother's reasons for unsuccessful exclusive breastfeeding for 6 months were inadequate breast milk (52.5%), infant avoiding (27.5%), and others (20%). The mean and SD of total health literacy score was 74.13 ± 14.36 with minimum 27.14 and maximum 100. Among the subscales, “understanding and perception” accounted for the highest score of 83.40 ± 16.54 and the reading 67.08 ± 19.66 accounted for the lowest. Other subscales had a similar mean score of around 73. 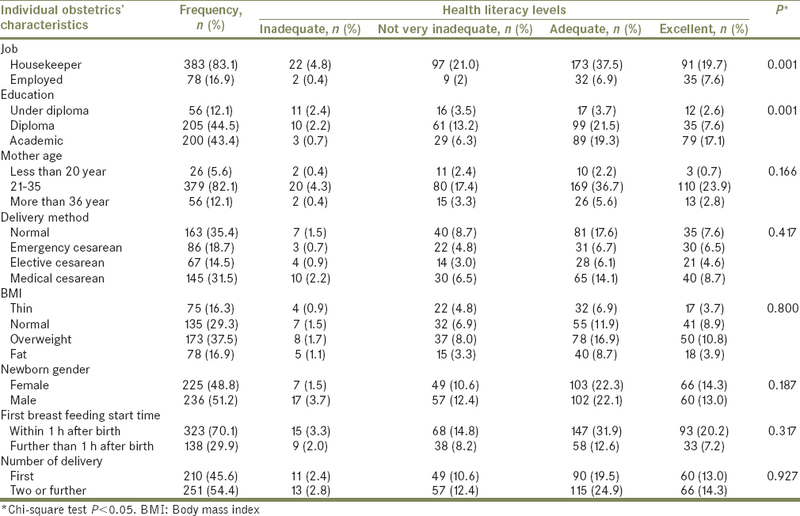 Regarding health literacy levels, 5.2% of mothers had inadequate health literacy, 23% had not the very adequate level of literacy, 44.5% had inadequate amount, and 27.3% had an excellent level of health literacy. Investigations made into comparing mean and SD of total health literacy score between breastfeeding pattern groups of mothers indicated that there is no significant statistical different (ANOVA test, P = 0.782) [Table 1]. Comparing subscales health literacy scores between breastfeeding pattern groups showed except in comprehension dimension (P = 0.016) in other subscales there is no significant statistical different (P > 0.5) [Table 2]. Considering the relationship between health literacy and individual characteristics of mothers, the results of the data analysis indicated that there is no significant relationship between the level of health literacy with age, BMI, delivery method, newborn gender, number of delivery and the breastfeeding start time (P > 0.5). However, there was a significant relationship between the health literacy level and mother's job and education level (P = 0.001) [Table 1]. Based on the results of the present study, there was no significant relationship between the levels of health literacy of mothers with their breastfeeding pattern. There are few studies available in the literature review which investigated the relationship between these two components. The results of research in Iran indicated that there was a positive and significant correlation between the mean of health literacy score and the perceived self-efficacy score of pregnant women for breastfeeding. Furthermore, there was a significant positive correlation between health literacy and breastfeeding outcomes in other study results. Accordingly, researchers introduced health literacy promotion as a significant tool for empowering pregnant women to start and continue exclusive breastfeeding. Because breastfeeding is a complex behavior that is affected by psychological, cultural, social and medical factors and factors such as social values, advertising, sexual issues, postpartum discomfort, and the amount of social support received affect it. Therefore, it seems that livelihood behaviors in the population happen independently of health literacy and affected by other components. The health literacy level of 71.8% of the mothers was sufficient and excellent, and 5.2% of the mothers had insufficient health literacy. The rest of the mothers had almost insufficient health literacy. This rate of general population indices in Iran is higher and is similar to the level of Iranian women's health literacy in childbearing age these results indicate that women health programs successfully in Iran. Based on the results of investigation of health literacy subscales, mothers earned the lowest score in the “Reading” subscale. In this regard, researchers raised the ability to read health texts as a health literacy challenge, and therefore recommended to write health texts under the fifth-grade literacy level. The extent of command on English as the international language of scientific literature was mentioned as one of the limitations of Iranian women to read and understand health literature. Based on the results of the present study, housekeeper mothers with under Diploma education level had a higher level of almost insufficient health literacy. In another study, the mother's age and education did not play a role in exclusive breastfeeding, while in other studies, the mother's age, the infant's age, the type of delivery, mother's employment, and education had a relationship with exclusive breastfeeding rate up to 6 months of age.,, Regarding the various results on the evaluation of the relationship between demographic characteristics and health literacy levels, it seems that more studies are needed to accurately evaluate the relationship between the individual characteristics of mothers and their breastfeeding behaviors. Since the maternity hospitals in Rafsanjan are considered baby-friendly hospitals, except for cases such as some preterm baby or acute neonatal problems that prohibit starting oral nutrition, breastfeeding is one of the priorities of these hospitals. Therefore, the vast majority of the infants who entered the study started breastfeeding right after the birth. Research results also indicate that the rate of onset of breastfeeding in the early hours after birth and its continuation is exclusively higher among women who gave birth in baby-friendly hospitals. The exclusive breastfeeding rate at 6 months of age was reduced to 68.8%, though this is higher than the minimum rate recommended by the World Health Organization for the Healthy People Program by 2025 (50%) and the country's average statistics (49.1%). This index is much lower in many developed countries and even in Asian countries., By and large, the desirable rate of onset of exclusive breastfeeding during the 1st h after birth and its continuation until the age of 6 months indicates the success of the programs of the Deputy of the health department of Rafsanjan University of Medical Sciences and the Ministry of Health and Medical Education of Iran and the World Health Organization regarding improving the health of mothers and children. Despite the limitations of a cross-sectional study, to analyze the relationship between the two components, the present study could provide the basic information on health literacy and breastfeeding behaviors of mothers with 6-month infants. Researchers suggest further studies using more precise methods in other societies with more diverse cultural and social characteristics. Based on the results of the present study, mothers under study had a good level of health literacy and the onset and the continuation of breastfeeding in the research society is desirable up to the age of 6 months. Based on the results of this study, breastfeeding behaviors of mothers likely to take place independent of their health literacy and to be affected by other personal and sociocultural factors. This study was financially supported by The Research Deputy of Rafsanjan University of Medical Sciences, Rafsanjan, Iran. This paper has been derived from project at the research council of Rafsanjan University of Medical Sciences with the approved code: 1394.83 IR.RUMS.REC. The researchers wish to thank the respected vice-chancellor of research and technology of Rafsanjan University of Medical Sciences for the financial support of this study, the employees of health service centers of Rafsanjan City, and all the women who collaborated in the implementation of this study. World Health Organization. Maternal, Newborn, Child and Adolscent Health: Breastfeeding. 2016. Available from: http://www.who.int/topics/breastfeeding/en/. Kramer MS, Kakuma R. Optimal duration of exclusive breastfeeding. Cochrane Database Syst Rev 2012;CD003517. doi: 10.1002/14651858.CD003517.pub2. World Health Organization. Child and Adolescent Health and Development: progress Report 20062007. Available from: http://www.who.int/maternal_child_adolescent/documents/9789241596497/en/. Ranjbaran M, Nakhaei MR, Chizary M, Shamsi M. Prevalence of exclusive breastfeeding in Iran: Systematic review and meta-analysis. Int J Environ Res 2016;3:294-301. Tan KL. Factors associated with exclusive breastfeeding among infants under six months of age in peninsular Malaysia. Int Breastfeed J 2011;6:2. Agushybana F, Siramaneerat I, Raksamat W, Siriphakhamongkhon S. Population-based survey of exclusive breastfeeding in Indonesia: A secondary analysis. Pac Rim Int J Nurs Res 2018;22:6-17. Jones JR, Kogan MD, Singh GK, Dee DL, Grummer-Strawn LM. Factors associated with exclusive breastfeeding in the United States. Pediatrics 2011;128:1117-25. Kuyper E, Vitta B, Dewey K. Implications of cesarean delivery for breastfeeding outcomes and strategies to support breastfeeding. Alive Thrive Tech Brief 2014;8:1-9. Machado MC, Assis KF, Oliveira Fde C, Ribeiro AQ, Araújo RM, Cury AF, et al. Determinants of the exclusive breastfeeding abandonment: Psychosocial factors. Rev Saude Publica 2014;48:985-94. Waits A, Guo CY, Chien LY. Evaluation of factors contributing to the decline in exclusive breastfeeding at 6 months postpartum: The 2011-2016 National Surveys in Taiwan. Birth 2018;45:184-92. Gillis DE, Gray NJ, Murphy E. Multiple domains of health literacy as reflected in breastfeeding promotion practice: A Canadian case study. J Health Psychol 2013;18:1023-35. Guntzviller LM, King AJ, Jensen JD, Davis LA. Self-efficacy, health literacy, and nutrition and exercise behaviors in a low-income, Hispanic population. J Immigr Minor Health 2017;19:489-93. Javadzade SH, Sharifirad G, Radjati F, Mostafavi F, Reisi M, Hasanzade A, et al. Relationship between health literacy, health status, and healthy behaviors among older adults in Isfahan, Iran. J Educ Health Promot 2012;1:31. Oldach BR, Katz ML. Health literacy and cancer screening: A systematic review. Patient Educ Couns 2014;94:149-57. Stafford JD, Lathrop E, Haddad L. Health literacy and associated outcomes in the postpartum period at grady memorial hospital. Obstet Gynecol 2016;127:66S-7S. Tsai TI, Huang SH, Lee SY. Maternal and hospital factors associated with first-time mothers' breastfeeding practice: A prospective study. Breastfeed Med 2015;10:334-40. Wang A, Scherpbier RW, Huang X, Guo S, Yang Y, Josephs-Spaulding J, et al. The dietary diversity and stunting prevalence in minority children under 3 years old: A cross-sectional study in forty-two counties of Western China. Br J Nutr 2017;118:840-8. Charoghchian Khorasani E, Peyman N, Esmaily H. Relations between breastfeeding self-efficacy and maternal health literacy among pregnant women. Evid Based Care 2017;6:18-25. Montazeri A, Tavousi M, Rakhshani F, Azin SA, Jahangiri K, Ebadi M, et al. Health Literacy for Iranian adults (HELIA): Development and psychometric properties. Payesh 2014;13:589-99. Kaufman H, Skipper B, Small L, Terry T, McGrew M. Effect of literacy on breast-feeding outcomes. South Med J 2001;94:293-6. Mulyani S, editor. Maternal Health Literacy Towards the Readiness of Exlusive Breastfeeding. 2nd International Seminar on Global Health; 2018. p. 123-7. Purdy IB. Social, cultural, and medical factors that influence maternal breastfeeding. Issues Ment Health Nurs 2010;31:365-7. Tavousi M, Haeri MA, Rafiefar S, Solimanian A, Sarbandi F, Ardestani M, et al. Health literacy in Iran: Findings from a national study. Payesh 2016;15:95-102. Haghighi ST, Lamyian M, Granpaye L. Assessment of the level of health literacy among fertile Iranian women with breast cancer. Electron Physician 2015;7:1359-64. Corrarino JE. Health literacy and women's health: Challenges and opportunities. J Midwifery Womens Health 2013;58:257-64. Neuhauser L, Kreps GL. Online cancer communication: Meeting the literacy, cultural and linguistic needs of diverse audiences. Patient Educ Couns 2008;71:365-77. Nikbakht Nasrabadi A, Sabzevari S, Negahban Bonabi T. Iranian women's experiences of health information seeking barriers: A qualitative study in Kerman. Iran Red Crescent Med J 2015;17:e25156. Bisi-Onyemaechi AI, Chikani UN, Ubesie AC, Chime PU, Mbanefo NR. Factors associated with low rate of exclusive breastfeeding among mothers in Enugu, Nigeria. Int J Med Sci 2017;5:3776-81. Aljawadi HF, Ali EA, Altimimi HA. Exclusive breast feeding incidence in the first six months of life and its associated factors. Mustansiriya Med J 2018;16:62-70. Bisrat Z, Kenzudine A, Bossena T. Factors associated with early initiation and exclusive breastfeeding practices among mothers of infant's age less than 6 months. J Pediatr Neonatal Care 2017;7:00292. Hawkins SS, Stern AD, Baum CF, Gillman MW. Evaluating the impact of the baby-friendly hospital initiative on breast-feeding rates: A multi-state analysis. Public Health Nutr 2015;18:189-97. World Health Organization, UNICEF. Global Nutrition Targets 2025: Breastfeeding Policy Brief. World Health Organization, UNICEF; 2014. Available from: http://www.apps.who.int/iris/bitstream/handle/10665/149023/WHO.NMH.NHD.14.8eng pdf?. Victora CG, Bahl R, Barros AJ, França GV, Horton S, Krasevec J, et al. Breastfeeding in the 21st century: Epidemiology, mechanisms, and lifelong effect. Lancet 2016;387:475-90.